Looking for something New to add to your regular fitness routine? Renew and invigorate your entire body through the GYROKINESIS® method. 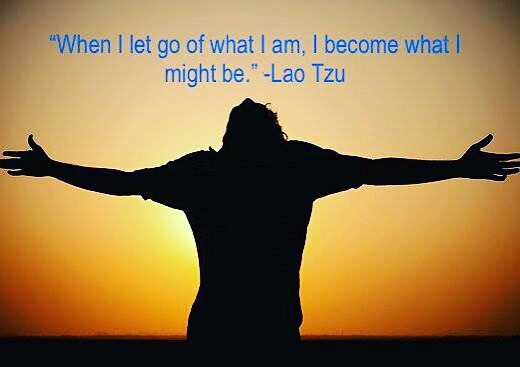 A movement method that moves you from the inside out! Raritan Valley GYROTONIC® of Westfield New Jersey offering GYROKINESIS®classes weekly! This beautiful movement method is available to everyone regardless of your individual fitness level, age or physical limitations. Regain vital mobility and flexibility through each joint. Increase strength and endurance. Improve balance and increase connections between the different parts of the entire body. The GYROTONIC® method takes you beyond the conventional linear exercise methods, into a spherical awareness. Begin the journey to increase the functional capacity of the spine, and obtain extraordinary flexibility and essential strength, rejuvenation, and increased vitality and vigor. GYROKINESIS® class uses the natural element of spinal movements through chair, floor and standing sequences, flowing from one movement to another. Each class progresses through seven types of spinal motions: forward, backward, left side, right side, left twist, right twist and circular. Rhythmic movements, systematic progressions, and specialized breathing patterns enhance your body’s fluidity and flexibility. 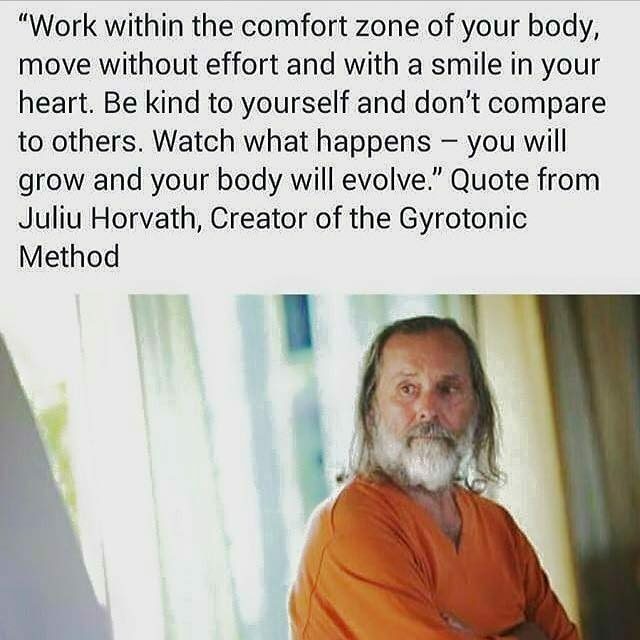 GYROKINESIS® was developed by Juliu Horvath. The motion concept includes the most important elements of yoga, dance and tai chi. GYROKINESIS® systematically and gently trains joints and muscles by rhythmic wavelike movements. The spine is considered the central supporting element which gains new flexibility by harmonic wavelike, spiral and circular movements. The corresponding breathing patterns stimulate the nervous system and open up the body meridiens thus releasing waste products and toxic substances that can be taken away by the oxygen-enhanced bloodstream. The flowing movement prevents static held-up positions and thereby superfluous body waste deposit and tensions. The method stimulates energy in a natural way and helps to overcome listlessness and lethargy. The training is done in groups standing up as well as lying down. The complete training program is done without any training machines so the acquired exercises can be partially repeated at home or at work to relax the body from one-sided working positions. People of all ages and different lifestyles benefit by this method, from therapy to high performance training for competitive athletes. 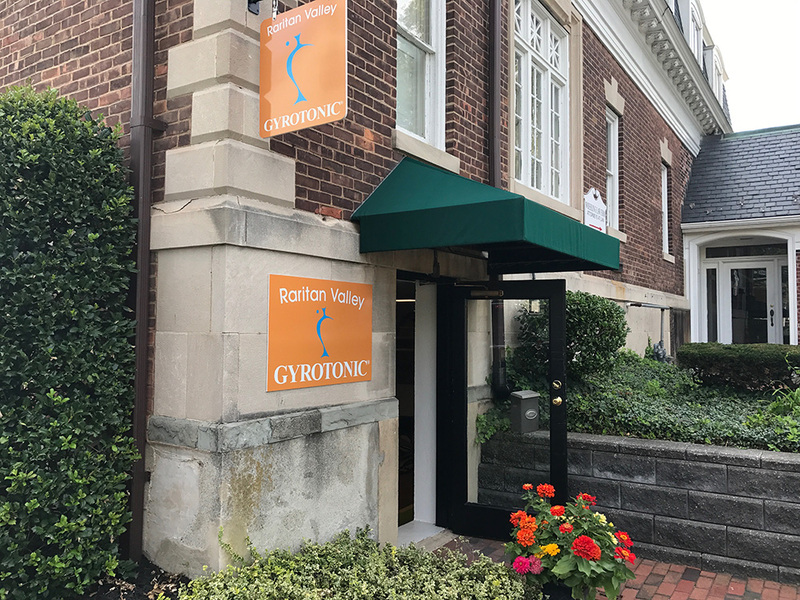 Raritan Valley GYROTONIC® of Westfield NJ now serving the community 100 Elmer Street Westfield New Jersey, 07090 We welcome everyone, all ages, and Fitness levels. Whether working one-on-one, or in a group session, the focus is on providing a personalized high quality training with a certified Gyrotonic and Gyrokinesis Trainer. We look forward to accommodating your unique needs and specific goals. 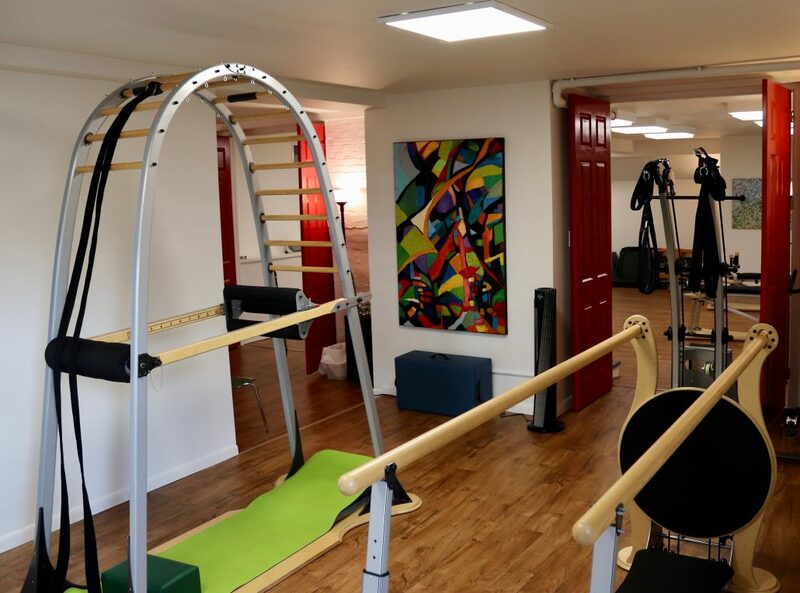 We specialize exclusively in the GYROTONIC EXPANSION SYSTEM® offering private, semi privates (duets) sessions, small group Gyrokinesis classes and Gyrotonic and Gyrokinesis trainings and teacher trainings. Our mission is being an authentic representative of Gyrotonic in our community and establishing a reputation as an authentic and high-end quality Gyrotonic and Gyrokinesis facility. Offering Gyrotonic and Gyrokinesis sessions taught based on the authentic curriculum. GYROTONIC®, GYROTONIC® & Logo, GYROTONIC EXPANSION SYSTEM®, GYROKINESIS®, GYROTONER® and The Art of Exercising and Beyond® are registered trademarks of Gyrotonic Sales Corp and are used with their permission. Aging gracefully and turning back the clock with the GYROTONIC® and GYROKINESIS® movement exercises at Raritan valley GYROTONIC® 100 Elmer street Westfield NJ. Begin the journey to increase the functional capacity of the spine, and obtain extraordinary flexibility and essential strength, rejuvenation, and increased vitality and vigor. Regardless of your age or fitness level. The Gyrotonic and Gyrokinesis method is progressive so we can start where you are at. If you have not exercised for a long time or have never really been involved in a exercise routine the Gyrotonic method is a gentle way to begin to move again, and as you get stronger the exercises increase in intensity and complexity. Full body movements, circular spirals and curves always involving motion at the spine very functional movements that teach the body to move in harmony with everyday activity. Gyrotonic exercises are performed on custom-designed Gyrotonic equipment, whereas Gyrokinesis exercises are performed on a mat and chair. Both methods are complementary movement methods that fall under one umbrella- the GYROTONIC EXPANSION SYSTEM. Raritan Valley Gyrotonic is located at 100 Elmer Street Westfield, NJ. 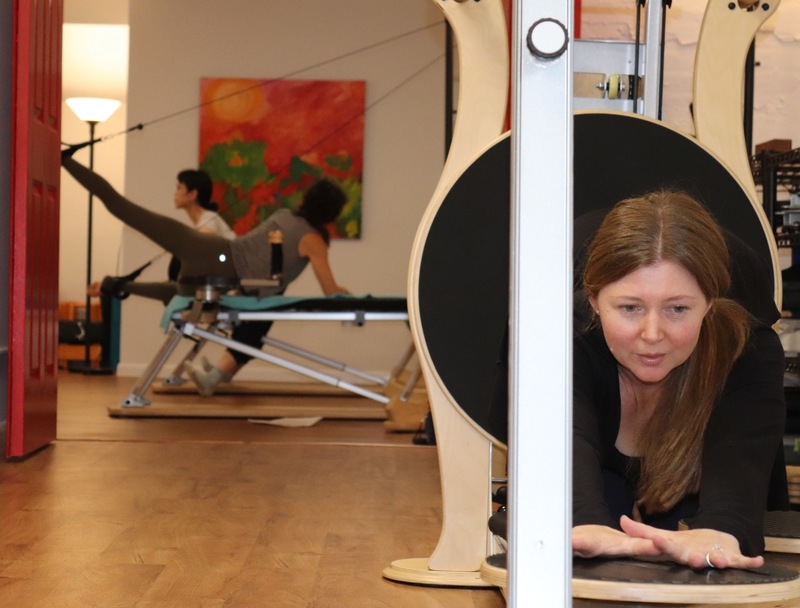 We are the only studio in NJ that is fully equipped with all of the specialized Gyrotonic equipment and offer private, duet Gyrotonic sessions and small group Gyrokinesis classes. Shirley is a certified GYROTONIC® and GYROKINESIS® trainer and an authorized GYROTONIC® and GYROKINESIS® Pre-trainer. She is certified in all Specialized Gyrotonic equipment, Archway, Jumping-stretch Board, Leg extension unit, and Gyrotoner and has completed several level 2 Gyrotonic courses and specialized Gyrokinesis trainings, Level 2 Beginners course, Level 2 Gyrokinesis, Breathing Course Intensive, Happy moves, Lotus Blossom 1, and Rejuvenation course. Shirley and has completed coursework with Master Trainers Sebastian Plettenberg, Erika Hassan, Juergen Bamberge, Dima Fedorov and Emily Smith and Jackson Kellogg and has attended the rejuvenation course in Germany with Juliu Horvath, the creator of this method. Shirley continues her GYROTONIC® and GYROKINESIS® training because this journey never ends, and looks forward to sharing this amazing, beautiful movement method with you. For all Ages! Raritan Valley Gyrotonic is located at 100 Elmer Street Westfield NJ. GYROTONIC® and GYROKINESIS® GYROTONIC EXPANSION SYSTEM® & Logo are registered trademarks of GyrotonicSales Corp and are used with their permission. https://www.rvgyrotonic.com/wp-content/uploads/2017/07/633441.RVG_.Reduced-300x200.jpg 0 0 Shirley Wallitsch https://www.rvgyrotonic.com/wp-content/uploads/2017/07/633441.RVG_.Reduced-300x200.jpg Shirley Wallitsch2018-10-12 09:06:142018-10-12 09:09:56Aging gracefully and turning back the clock with the GYROTONIC® and GYROKINESIS® movement exercises at Raritan valley GYROTONIC® 100 Elmer street Westfield NJ. Join us in our celebration of Movement and Art! People still do not know what GYROTONIC® is and words really can not describe this movement method. You really need to experience it in your own body. This exercise movement method is truly for all ages and all walks of life. From athletes to senior citizens. It is a intelligent exercise method that works the entire body. Gyrotonic exercises resemble a combination of swimming, Tai Chi, dance and yoga. Gyrotonic movement increases strength and range of motion using specific sequences of repetitive, undulating, and spiraling and circular motion. The gyrotonic methods involves diversity of movement using a variety of planes and relationships with gravity. Every movement is full body movements. Gyrotonic sessions use specialized equipment and Gyrokinesis classes are done on stools, mat and standing without the use of equipment. GYROTONIC®and GYROKINESIS®movement methods are a holist approach to fitness, takes you beyond the conventional linear exercise methods, into a spherical awareness. Begin the journey to increase the functional capacity of the spine, and obtain extraordinary flexibility and essential strength, rejuvenation, and increased vitality and vigor. Everyone welcome and a big shout out to the baby boomers this method is for you to turn back time. Raritan Valley Gyrotonic -We specialize exclusively in the GYROTONIC EXPANSION SYSTEM®. Offering private, semi privates (duets) sessions, small group Gyrokinesis classes and Gyrotonic and Gyrokinesis teacher trainings. 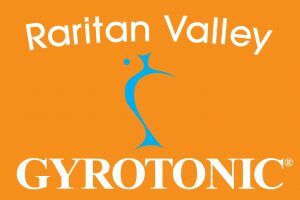 Why did I choose Raritan Valley as my Gyrotonic licensed name? It actually required some time and research. I needed to choose a name that reveals a location. As I am located in New Jersey and with so many small towns here I did not want to limit myself to one town in the event I move location of my Studio. And I wanted a natural geographical connection. In my research I discovered that the Raritan Valley is a very large northeastern part of New Jersey that reaches all the way to the New York Bay. The Raritan River is about 75 miles long formed by the confluence of two tributaries in north-central New Jersey and flowing eastward to Raritan Bay, the western arm of Lower New York Bay, at Perth Amboy. So the Raritan River became my geographical connection here in New Jersey. Beyond this Raritan was the name given by Europeans in the seventeenth century who colonized the region around what is now called the Raritan River and its bay, to the Native American bands of Lenape people then living in what now northeastern New Jersey and Staten Island, New York Island. Raritan is generally believed that the name comes from one of the Lenape languages (among the languages in the Algonquian language group), though there are a variety of interpretations as to its meaning. It may be a derivation of Naraticong  meaning “river beyond the island”, or Roaton or Raritanghe, names of a group which had come from across the Hudson and displaced the previous population known as Sanhican. (who moved to farther into the interior). Alternatively, Raritan is a Dutch pronunciation of wawitan or rarachons, meaning, “forked river” or “stream overflows”. Along with a rich geographical and historical meaning the name Raritan Valley also moves us to the present with NJT Raritan Valley line that connects New Jersey to New York City. Raritan Valley GYROTONIC® now located in Westfield New Jersey. 100 Elmer Street Westfield NJ 07090 located 3 blocks from the NJT the Raritan Valley Line 1 hr from Penn Station NY. We are the only Gyrotonic studio in New Jersey that is licensed to use the Gyrotonic logo in our name. We invite to contact us and schedule a private session and discover for your self this amazing and unique movement method. Increased functional capacity of the spine, better coordination, overall increased strength, flexibility and Increased mobility of the joints and the use of the fullest capacity in all directions and Improves circulation with an excellent cardio benefits. Start your Journey with our New client special 3 Private sessions $195 Strongly Suggested, or sign up for a Gyrokinesis class all are welcome! For more Information contact Shirley Wallitsch Owner and certified Gyrotonic & Gyrokinesis Teacher. Copyright © 2014. Raritan Valley Gyrotonic. All right reserved. Designed by G4 Design House. If you are new to this method it is strongly suggested you begin with at least 3 private sessions. This will allow you to experience for yourself this unique movement method. As with yoga or pilates there is a learning curve with the gyrotonic technique. 100 Elmer Street Westfield NJ,07090. for there own practice and those moving on to become GYROTONIC® and GYROKINESIS® trainers. Both courses are being conducted by Authorized GYROTONIC® and GYROKINESIS® Pre-trainer Shirley Wallitsch. Not finding dates that work for you? Request a training. Offering now: Travel to your location! Will travel to your location to teach Both GYROTONIC®and GYROKINESIS® Pre-trainings and GYROTONIC®GYROKINESIS® Pre-trainings extended course with an additional 3 days for students that need, or desire extra training to be prepared for the foundation courses. All traveling courses would require cost of travel and Extended courses and private Pre-trainings would be additional costs. To provide a foundational understanding of the Gyrotonic level 1 exercises and prepare students physically for the Gyrotonic Level 1 Foundation Course. During this course students focus on gaining experience, and developing a personal understanding of the exercises on the Pre-Training Course exercise list. An experienced Gyrotonic student, with a basic understanding of the Gyrotonic, level 1, progression I exercises. Students should take a minimum of ten or more classes with a Certified Gyrotonic Trainer before registering for this course. For students who do not have access to Gyrotonic classes, a three day introductory course designed to provide an introduction to the Gyrotonic level 1, progression 1 exercises can be taken before the Pre-Training Course. Once students have successfully completed the Gyrotonic Level 1 Pre-Training Course, they may proceed to the Gyrotonic Level 1 Foundation Course. To provide a foundational understanding of the Gyrokinesis level 1 exercises and prepare students physically for the Gyrokinesis Level 1 Foundation Course. During this course students focus on gaining experience, and developing a personal understanding of the exercises on the Gyrokinesis Level 1 Pre-Training Course exercise list. An experienced Gyrokinesis student, with a basic understanding of the Gyrokinesis, level I class formats. Students should take a minimum of 10 or more Gyrokinesis classes with a certified Gyrokinesis Trainer prior to registering for this course. Once students have successfully completed the Gyrokinesis Level I Pre-Training Course, they are qualified to proceed to the Gyrokinesis Level 1 Foundation Course. trademarks of Gyrotonic Sales Corp and are used with their permission. Gyrotonic and Gyrokinesis Teacher Trainings. Group classes via the online Class Scheduler. Our mission is to be an authentic representative of Gyrotonic® in our community while establishing a reputation as a high-quality Gyrotonic® and Gyrokinesis® facility. We offer Gyrotonic® and Gyrokinesis® sessions taught based on the authentic curriculum in an environment that is beautiful and inspiring! Copyright © 2018. Raritan Valley Gyrotonic. All right reserved. Designed by G4 Design House. GYROTONIC®, GYROTONIC® and Logo, GYROTONIC EXPANSION SYSTEM®, GYROKINESIS®, GYROTONER® and The Art of Exercising and Beyond® are registered trademarks of Gyrotonic Sales Corp and are used with their permission.